Sainted German, Archbishop of Kazan, lived during the XVI Century. He was born in the city of Staritsa, and was descended from the old boyar-noble line of the Polevi. 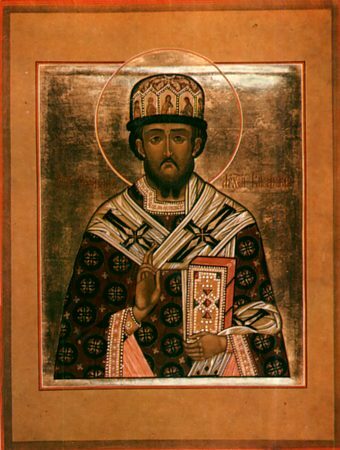 In his youthful years Grigorii (such was his name in the world) took tonsure at the Josepho-Volokolamsk monastery under the Hegumen Gurii, who afterwards became likewise a Sainted-Archbishop of Kazan (+ 1563, Comm. 5 December). (Saint Gurii was head of the monastery from 1542 to 1551). At the monastery Saint German occupied himself with the copying of books, and he was close with the Monk Maxim the Greek, living there confined. In 1551 the brethren of the Staritsa Uspenie monastery, having learned of the piety of their native-son, chose him as their archimandrite. Having entered into the guidance of this monastery, Saint German with a pastoral zeal concerned himself over its disposition, both outer and inner, – for the monk himself was a model of humility and meekness. He exhorted all to strictly observe their monastic commitment, and for guidance he introduced into his monastery the ustav/rule of the Monk Joseph of Volotsk (+ 1515, Comm. 18 October). But after two and an half years Archimandrite German left the Staritsa monastery, having transferred its guidance to the priestmonk Job, who afterwards was to become the first Patriarch of Moscow, and was an ascetic and sufferer for the Russian Land. Saint German's love for solitary efforts brought him to return to his original Volokolamsk monastery, where he strove towards his salvation as a simple monk. When however there appeared at Moscow the new heretic Matfei Bashkin, who refused to acknowledge the Holy Sacraments and denied faith in the Holy Trinity, Saint German together with his own father (who himself had received tonsure at the Volokolamsk monastery with the name Philothei) was called to the Moscow Sobor (Council) of 1553. The Sobor censured the heretic Bashkin and resolved to send him for enlightening to the Volokolamsk monastery to Saint German, as one known for his holy life and zeal for the faith in Christ. In 1555, after the taking of Kazan, an archbishopal cathedra-seat was established there, upon which they designated as archbishop the former hegumen of Volokolamsk monastery, Saint Gurii. To him was entrusted to build for missionary purposes an Uspenie monastery in the city of Sviyazhsk. By decree of Saint Gurii, the designated head of this new monastery of the Uspenie-Dormition of the MostHoly Mother of God in Sviyazhsk was Saint German. A stone cathedral with bell-tower and monastic cells was built. And the monastery head himself lived very frugally, in a cramped cell beneathe the cathedral bell-tower. And Saint German concerned himself particularly over the gathering together of a monastery library. Soon his monastery became far-famed for its doing of good, and it became a centre of enlightenment for the Kazan region. On 12 March 1564, after the repose of Saint Gurii, Saint German was consecrated bishop of Kazan. The short duration of his cathedral guidance was marked nonetheless by concern over the building of churches and the enlightenment of the region. In 1566 Ivan the Terrible summoned Saint German to Moscow and gave orders to elect him to the Metropolitan cathedra-seat there. Saint German at first refused to have this burden imposed upon him. The tsar would not tolerate any objection and the saint was obliged to settle into the Metropolitan quarters until his elevation to the dignity of Metropolitan. And seeing the injustices on the part of the tsar's inner circle, Saint German, true to his pastoral duty, attempted to reason with the tsar by his admonitions. – "Thou art not yet elevated to Metropolitan, and already thou placest constraints upon my freedom", – communicated the tsar through his cronies and gave orders to expel Saint German from the Metropolitan quarters and hold him under surveillance. The saint survived for about two years in disgrace and on 6 November 1567 he died. They interred him in the church of Saint Nicholas the Hospitable. And later, at the request of the inhabitants of Sviyazhsk, the relics of the saint in 1592 were transferred from Moscow to the Sviyazhsk Uspenie monastery. Saint Ermogen, then Metropolitan of Kazan, paid visit to his grave.